In our daily development,some times we may need to store data and access it for later use.So as developer choice we need to decide "which way is best to store data?" and this decision making would be change based on amount of data to be store.However windowsphone is very good at this case . Because windowsphone is provided following ways to store our application data. 1)IsolatedStorageSettings:It is very very useful for storing some basic application settings like user profile settings,and especially in login application after login successfully app need to be home screen when user again launch the app. 2)IsolatedStorageFile: It is available from "System.IO.IsolatedStorage" namespace to access files.And i am really addicted with this uses ,because it is very handy and simple way to store data.It is enough for most of applications.And no limit to data store but of course you'll get an exception if you run out of space when writing new data, so you have to handle that properly. 3)SQLite:It is very useful to store data in database with structured way, Mmm this concept is covered by this post.And this article covers windowsphone 8 sqlite database.So if you want to implement database application for windowsphone 7,you may helped from this link Sqlite client for Windows Phone 7 and for sample see this post. To run this sample ,you must install windowsphone 8 sdk or higher sdk from here. Unfortunately SQLite is directly not available in windowsphone devices.And in previously it included lot of hard steps to setup sqlite in windowsphone application.But now we are very happy ,because of now it is very easy to setup sqlite environment in our apps.So this post covers all about sqlite with beginners level like this. 1)How can i setup SQLite environment? 2)How to perform all SQLite CRUD operations ? 3)How to bind SQLite data to listbox? 4)How to explore my"SQLite" database data? SQLite is a very light weight database. In this tutorial I’ll be discussing how to write classes to handle all SQLite operations.So let's start with above hierarchy which is earlier discussed in "Table of Contents". The first step is installing the SQLite for Windows Phone SDK in the Visual Studio that you are using. To do that, click on TOOLS -> Extensions and Updates -> Online -> Then search for "sqlite for windows phone". It should look like the following picture. Click on Download and then click install,the Visual Studio restart after the download is completed. The below image is shown when the download and installation is completed. You will be redirected this link .It may not useful for you,but best to read this document.And we need to add this extension to our project like this. Now one good news is "sqlite-net-wp8 package" is available on Nuget which is previously not available and i say very thankful to creator "Peter Huene".This is a c++ project can works like mediator between SQLite and our source code. 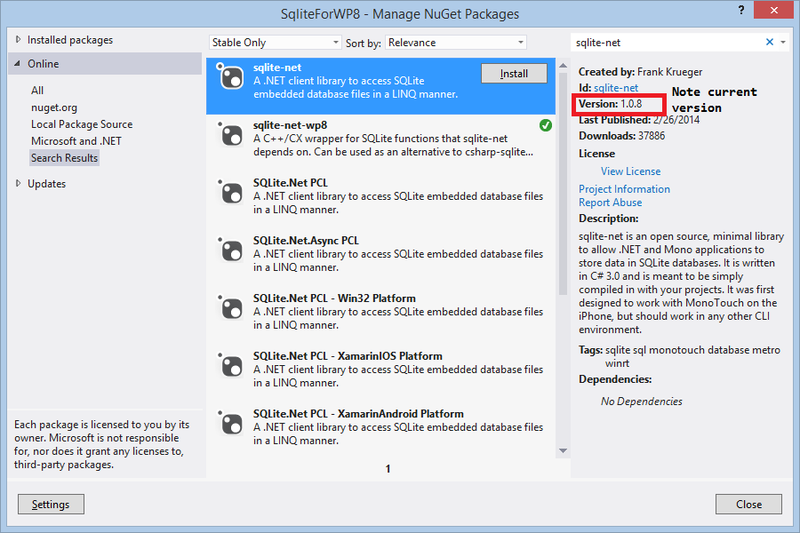 So to install it right click on your project (i.e in my case project name is SQLiteWp8) =>Click on "Manage NuGet Packages" and search for "sqlite-net-wp8" => Click on "Install" button. Now we are almost completed SQLite setup.But in addition we need to add sqlite-net package which is available from nuget. Because this package provides two helper classes (SQLite.cs and SQLiteAsync.cs) which are play vital role to perform all SQLite operations.So to install it right click on your project (i.e in my case project name is SQLiteWp8)=> Click on "Manage NuGet Packages" and search for "sqlite-net" => Click on "Install" button. 2)You receive an error cannot find a type or namespace SQLite.Verify you have the conditional constants set. Verify you have added a reference to SQLite. If you get a warning message as shown below, follow these steps to fix it: Right click on the Solution -> Click on Configuration Properties -> Configuration Manager and change the active solution platform to x86 (If you are using an emulator) or ARM (If you are using a Windows Phone 8 device). Here i am trying to create Table name is "Contacts" in "ContactsManager.sqlite" database.So my class "Contacts" with all getter and setter methods(Id,Name,PhoneNumber,CreatedDate) to maintain single contact as an object. // Retrieve the specific contact from the database. // Retrieve the all contact list from the database. // Insert the new contact in the Contacts table. In the app.xaml class lets create a database. In the constructor we check if the database exists and if it does not we create it. Since if there is no file exists ,it will get an exception. listBoxobj.ItemsSource = DB_ContactList.OrderByDescending(i => i.Id).ToList();//Binding DB data to LISTBOX and Latest contact ID can Display first. When "Add Contact" button is clicked is navigated to "AddConatct.xaml" page to add contact in DB. When selected listbox item ,i navigate to "Delete_UpdateContacts.xaml" page for delete/update corresponding contact details on listbox SelectionChanged event like this. When "Delete" button is pressed i done like this. Db_Helper.DeleteContact(Selected_ContactId);//Delete selected DB contact Id. When "Update" button is pressed i done like this. 4)How to explore my SQLite database data? The app that you want to test must be installed on the emulator or device. The emulator or device must be running, but the app doesn’t have to be running. You can’t view isolated storage for apps that you’ve installed from the Windows Phone Store. You can’t view app settings that are stored in the local folder in Isolated Storage Explorer. These are settings that the app saved by using the IsolatedStorageSettings class. After that execute following commands from command prompt. Now we will be found DB content in your computer at c:\data\myfiles like this. After downloaded from the Store you app may not be create database file.So copy your existing database file and paste it into your project root folder by right click your project=> Add Existing Item=>Browse to c:\data\myfiles\ContactsManager.sqlite. In your Application_Launching event of App.xaml check whether database is existing or not.If not exist,then copy the your database file from installed folder to local folder.Thats it will fix the app store issue. Note:Make sure to change the Copy to Output Directory property of ContactsManager.sqlite file to Copy if newer. // Copy file from installation folder to local folder. // Create a stream for the file in the installation folder. // Create a stream for the new file in the local folder. // Copy the file from the installation folder to the local folder. FeedBack Note: Please share your thoughts,what you think about this post,Is this post really helpful for you?otherwise it would be very happy ,if you have any thoughts for to implement this requirement in any another way?I always welcome if you drop comments on this post and it would be impressive. HI prem presently i am only concentrate on WindowsPhone tutorials..Because I am big fan of windowsphone even i am android developer.And now i am full satisfactions with this blog ,I am really thanks to my dear visitors,Because they makes me with lot of encouragement with active role in my blog by asking/requesting sample to be post.However as per your request i was planned to post articles on three platforms(WindowsPhone,Iphone adn Android ).Please see my future blog look like this .But it will be take time to construct that blog. How to get files from isolated storage. After performing all the steps and configuring the platform. It is a great tutorial. But can you please tell me one thing, how to read the blob data stored in a sqlite table?. I have kept the column as byte array in the class. But looks like it does not returning the correct value. Is there any way to resolve this by reading database as stream, or something?. I am very new at windows phone app. Hi it's really nice tutorial, but I have one error I have red line under DB_ContactList why is that happing how can I solve this problem. many thanks. Hi pls put the code for ReadAllContacts.cs file. Its shown in screenshot, but not code is not provided. the following code is throwing error. pls let me know the reason. listBoxobj.ItemsSource = DB_ContactList.OrderByDescending(i => i.Id).ToList();//Binding DB data to LISTBOX and Latest contact ID can Display first. Are you sure about inserting alt-east one contact item to database before reading contactlist from database.And you may check source code by downloading this sample. Yes i have one entry in DB for sure. I inserted using SQLite Manager Client of Firefox. Pls. let me know where i could find code for as suggested by you. There is add button for inserting contact into db "AddConatct.xaml" page .Have you found it? Where is the source code to download for this project? can you please provide the tutorial on using sql lite for windows phone 8.1. Download source code and check 'ContactManager.sqlite' file name in App.xaml.cs. how did you create the file ContactManager.sqlite? when I run it I get this exception: System.IO.FileNotFoundException. Download source code and check 'ContactManager.sqlite' file name in App.xaml.cs,And also please check STEP 1.1 ,we need to add sqlite extension to our project like this. Open Solution explorer,Right click on 'References'=>Choose WindowsPhone=>Extensions =>select 'SQlite for WindowsPhone'=>Press 'Ok'. Generally in this sample 'System.IO.FileNotFoundException.' error occurs when we did not reference the sqlite extension to our project. Please click on 'Download Code' from bottom of the post,have you seen that...It will be redirect to source code page. How to do database update for new versions , without effecting the old users. please tell me. Nice work...How to do Select count and then i have to insert values depends on count..Any suggestions..
Can you show me how to store(insert, select update) XML file to(from) SD Card, Please! So, Is this code helps me to create an application library (books) ?! How can I read the contacts and edit the phone numbers?In Brazil it is adding another digit in phone numbers.I would like to develop this feature. Thank you. can anyone please elaborate on the part for downloading database file from emulator to computer I dint got it. Hae Subbub, I have used your tutorial and it has helped me so much. However, after submitting my app to the windows phone store, it never passed certification. They are giving me this issue, the application is exiting on launch. I copied the database to the root folder of my project aand copied if newer. My question was, how can I test whether my database on the root folder is working or not? This is fantastic tutorial. But i have one issue. Please Help me. I am waiting your response.